More action on the Duffield Street Underground Railroad Houses front. Those are the historic homes in Downtown Brooklyn that the city wants to demolish to make way for underground parking for hotels across the street and other nearby developments. Many historians believe the buildings were safehouses for the Underground Railroad. 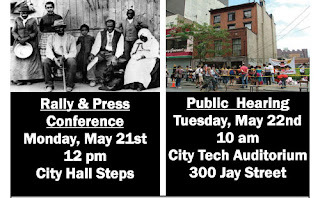 There is a rally today (5/21) at City Hall at Noon and a Public Hearing tomorrow (5/22) at 10AM at City Tech Auditorium, which is at 300 Jay Street. A very expensive report by paid city consultants did not find evidence the buildings were safehouses, but advocates for the houses strongly disagree and say the consultants skewed their findings. You can see more about the rally and hearing at No Land Grab and at Brit in Brooklyn.